Aventúrese fuera del centro de la ciudad para explorar algunas de las atracciones imperiales menos conocidas pero más impresionantes de Roma en este tour en bicicleta de 3 horas. 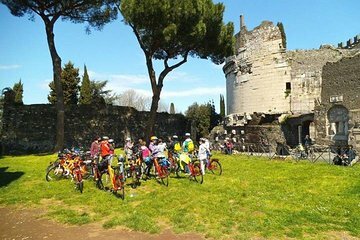 Recorra en bicicleta el legendario Appian Way, un antiguo camino militar que serpentea a través del campo y conecta Roma con la ciudad costera de Brindisi. Pedalea por la antigua Vía Apia, una importante vía militar.  Advertised as leisurely 3 hour bike tour of Appian Way. WHAT? We spent 45 minutes riding in the busy streets of Rome -- each way. One bike had bad gears, low air in tires and got a flat tire. Very difficult hills, uneven roads, traffic and not much to see -- didn't even see aquaducts. Very different from what was depicted in our research. This was so fun! We really felt like locals as we crossed streets and rode with the traffic on the streets of Rome. Francesca was the best! She slowed down with us when the hills made us slow. There are no hills where we live! Her explanations of what we were seeing were very interesting. She was patient and informative. We would do it again. I don't think we could have done the longer bike tour that takes you further into the countryside. We thought we were going to see more of the aqueducts and the catacombs but that is on the longer tour. The bikes were great. By the way, we are a couple in our middle 60's. I'd highly recommend doing this tour if you like to ride bikes. We are just recreational riders. This was my family's favorite tour. Our guide, Kate, was fantastic. She was very alert to our needs, since there were just a few tougher hills, that we weren't quite in shape for, she stopped and let us rest a few extra times when we needed it. I wouldn't do this tour in the hotter months but in Spring it was fantastic. There is some wonderful history that most Rome visitors just don't get to go see because it is a bit further out of the way but it is beautiful and our guide was very knowledgeable and nice as could be. Great tour. So much fun and so interesting! It was a great way to see and learn about Rome. Our tour guide was Eddie and he was phenomenal. The tour was very informative. The bike rental office is located down the road from the Colosseum which I think is a great location to start a bike ride. Multiple stops made the ride less tragic for me considering I had not ridden a bike in over 10 years. We also stopped midpoint for a quick snack at a quaint little restaurant with delicious food. Exciting way to see the countryside of Rome! We had so much fun on this tour! Our guide, Elisha, did a fantastic job of guiding us through the city to the Appian Way. We made a few stops along the way and she watched the bikes as we went in a beautiful Church, explored the 2nd wall of Rome, and other sites. Our tour was on Boxing Day, which was a holiday. This made it a little tricky to navigate through the extra people, but also provided a very special day as we got to join Italians families riding bikes and jogging together. 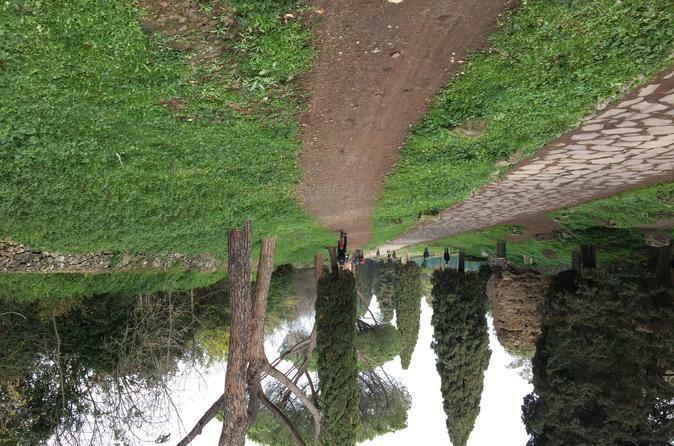 Just a warning that the trip did have some big hills to ride up and down and we rode over cobblestone roads, dirt trails, and the boulders of the Appian Way. We felt like we got a good workout after the tour. It was great for our two teenage boys. This tour definitely stands out as one of our favorite activities! This tour started out in the city which is a bit terrifying with all of the traffic. I used my helmet all of the time. This is a very challenging bike tour not something for children or unhealthy people. Although we did stop to fill out water bottles and for lunch, during the summer time it is extremely hot and the 'roads' we traveled were made BC and at times we rode through the woods. In some areas we had to walk our bikes because the terrain was too difficult. I fell down once because of the terrain but was ok. It was nice to see the outer areas of Rome, learn a little about it's history, and fit some exercise into the trip. You ride through the area where the catacombs are, but you do not visit them. My only advice would be that it is not for children or unfit people. My guide was super nice, lunch was good and it was easy to find the tour office unlike some other tours. I was lucky there were only 2 people on this tour. I can't imagine 1 guide with more than 4 or 5 people. We were very disappointed in this tour. Rugged terrain, traffic and a tour leader who had no concern about our safety or comfort level were the main reasons we did not enjoy it. An accident waiting to happen. The Appian Way was just OK. The Aqueducts Park was not very interesting. Wife and I went on this tour and I highly recommend it. We are 50 and handled the trip with ease along with another couple and their son. It was close to the city, but far enough out for traffic not to be an issue. The scenery was gorgeous with plenty of history stops. Our guide, Paul, did a great job and kept the pace and stops just right. At Paul's suggestion, we did a catacombs tour along the way and it fit right in with the history of the tour. Overall, this was the highlight of our trip. My wife and I had an amazing time on this tour. Our tour guide Alan was awesome. He was extremely knowledgeable and we learned so much about the Appain Way and ancient Rome from him. Anna and Marco at Wheely Bike Rentals and Tours did a great job arranging this tour. It was the highlight of our trip. I would highly recommend this tour to anyone visiting Rome.